Home > Material Handling > Can we all just get along? When it comes to DC workers and their mechanical counterparts, the answer is probably yes, if collaborative robots perform as intended. If there were a GQ magazine for robots, the boys in the photo above could be cover material. They're strong, flexible, and have eyes to die for. They're so lifelike that an executive of Deutsche Post DHL Group, the German transport and logistics giant testing their use, referred to one in an interview as "he" before correcting himself with a chuckle. Deutsche Post DHL chose "Baxter" and "Sawyer" because their "humanoid faces" would increase their acceptance among its distribution center workers and make the workers feel more at ease toiling alongside them, said Denis Niezgoda, project manager, innovation and trend research, for the company's customer solutions and innovation unit. "It's a simple concept," but one that has so far proved to be effective, said Niezgoda, who oversees the pilot deployment of four robots being used to execute co-packing functions at facilities in the U.S., the U.K., and the Netherlands. If imitation is the sincerest form of flattery, flesh-and-blood types should take the next wave of robotic design as a compliment. Robotics developers, aware that direct human-machine interaction is inevitable, are creating robots with more humanlike characteristics than ever before. Within the next five to 10 years, a large number of "collaborative robots," or "cobots," will be scooting around DCs without the markers, magnets, beacons, or tracks that guide the movements of traditional industrial robots. It will become second nature for workers to take a robot by the hand (or the wrist) and walk it through the repetitive and hazardous tasks the humans used to do. Sophisticated elastic "actuators" implanted in a robot's joint will enable its arms to detect impending contact, and to be flexible and pliable in much the same way as a human arm. Thanks to force-sensing technology that commands robots to stop whenever they touch another object, the newfangled versions don't need to be sequestered in safety cages to avoid nasty collisions, as is the case today with industrial robots. Cobots will likely be a less costly investment than their industrial brethren, partly because they will be built more efficiently, and partly because companies can do away with all of the expensive apparatus that came with supporting an industrial robot work force. In a backgrounder on its website, Rethink Robotics, a Boston-based startup that built Baxter and Sawyer, said its creations "can adapt to real-world variability, change applications quickly, and perform tasks like people do." The robots can be trained in minutes, and workers can take them "by the wrist" to demonstrate how the task is done, the company said. 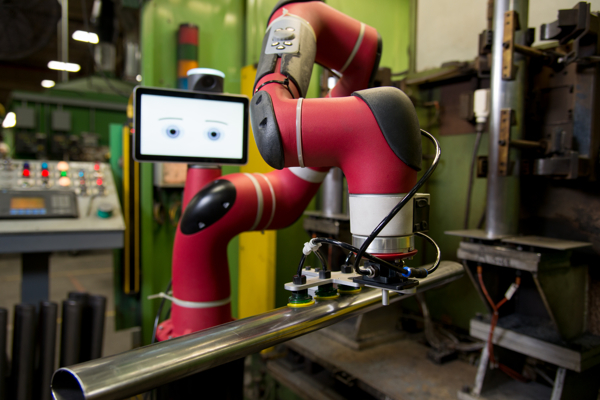 In contrast to traditional robots that need to be programmed over many hours by an engineer or consultant, virtually anyone can quickly get up to speed on Baxter and Sawyer, the company said. (Rethink Robotics executives declined to be interviewed for this story.) Niezgoda said he was fully versed on Baxter in a day or two, and then set up Sawyer without needing to refer to the instruction manual. Given concerns that advances in artificial intelligence will result in the elimination of peoples' jobs, it is natural that DC workers in relatively low-skilled occupations would see cobots as threats to their livelihood. Those worries may be overblown, however. For one, no expects an armada of cobots to land overnight at the doors of DCs. Of 900 executives surveyed by the material handling industry trade group MHI for its 2016 annual industry report, more than half said robotics use would grow significantly over the next five to 10 years, but nearly three-quarters said it would take six years or longer to introduce robotics into their operations. Autonomous equipment manufacturers emphasized that robots are designed to perform tasks that humans don't want to do, or that they shouldn't be doing. This would free up people to handle more value-added tasks, including the programming and operation of robotics systems as well as managing the robotic fleets, they said. "You could have a force multiplier, with one person marshaling 10 [machines] as opposed to one," said Jeff Christensen, vice president of products and services for Seegrid Corp., a Pittsburgh-based maker of automated guided vehicles (AGVs). Aldo Zini, president and CEO of Pittsburgh-based Aethon Inc., which has sold about 500 autonomous robots under the "Tug" brand, said his machines have not led customers to displace their workers and that their use has improved the value and quality of human labor. "We're enabling people to do things they couldn't do before," Zini said. "People have not been let go. They've been redeployed and, in many cases, it's enhanced the jobs that they do." In addition, the machines help prevent injuries by reducing the amount of heavy manual work a human has to perform, Zini said. Most Tugs are currently used in hospitals. However, Aethon has expanded into the manufacturing sector, and Zini sees the DC space as a natural extension of the company's growth plans. Niezgoda of Deutsche Post DHL said the cobots' flexibility and ease of operation makes them ideal trainees. "We want to enable our workers to supervise the robots, to take them from one task to another, and to adjust them if something isn't working," he said. 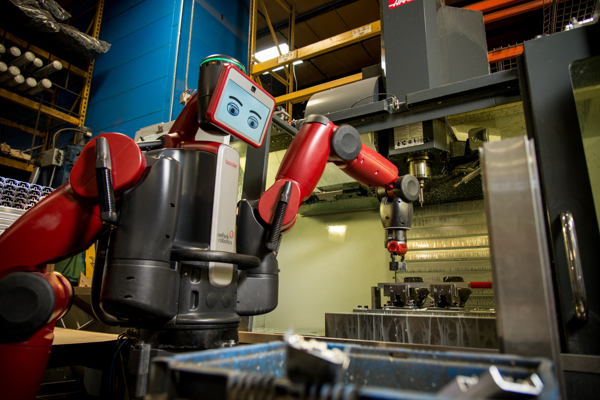 "These robots are capable of doing specific tasks, and our workers are capable of teaching them." While managers tout a world where people can leave boring and repetitive DC tasks to robots so they can focus on more productive and enjoyable work, some are also aware of societal friction as robots assume functions once reserved for the human worker. According to Christensen, companies need to follow a multistep checklist when integrating humans and robots in the same environment. At the core, he said, is to build trust between human workers and their automated colleagues. This includes involving employees in training and automation, bringing the product into the facility before it is deployed so workers can see how it operates and the value it delivers, publishing quantifiable results of a robot's functions and how it benefits the business, and ensuring employees have complete visibility into the machines' movements so they can coordinate schedules, among other objectives, he said. Given the trends in fulfillment, robots are only going to proliferate in the DC. As customers order more products online and demand faster deliveries, filling those orders will place more stress on supply chains. At the same time, about 90 percent of material handling relies on manual labor, and people can't work exponentially faster. Rising labor costs and a shrinking labor pool, especially as the work force ages, only add to the challenges and the need for automated solutions such as cobots to meet them. The good news for humans is that robotics innovation is putting a new generation of collaborative machines, and the technology they possess, in the hands of people who can discover new and stimulating skills in training them. The mission for those on the vanguard of this change is to persuade their fellow humans that the outcome of the human-robot mating dance will be a good one. As the 2016 MHI report states, "While it is clear that robotics and automation will have a significant impact on supply chains within the next decade, their adoption will hinge as much on public perception as [on] the savings they create." Feedback: What did you think of this article? We'd like to hear from you. DC VELOCITY is committed to accuracy and clarity in the delivery of important and useful logistics and supply chain news and information. If you find anything in DC VELOCITY you feel is inaccurate or warrants further explanation, please ?Subject=Feedback - : Can we all just get along? ">contact Chief Editor David Maloney. All comments are eligible for publication in the letters section of DC VELOCITY magazine. Please include you name and the name of the company or organization your work for.